Streamline. Schedule. Stay on Track. Advanced project management and effortless time-tracking. FunctionFox saves you time and helps you be more productive. Simplify task assignment and scheduling for optimal productivity. Align Production schedules with estimates and budgets. Clarify communication with easy, accurate progress updates. Spend less time on logistics, and more time on growing your business. Effortless Time-Tracking. Comprehensive Reports. Smooth, efficient workflow. Simple online timesheets for real-time project updates. Flexible time tracking — manually or with a built-in timer. Extensive, up-to-the minute reports about clients, projects, and personnel. Insight into business performance, that grows with each project. 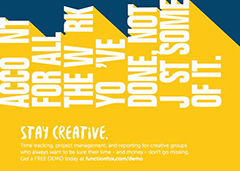 With more than 100,000 users in over 100 countries, FunctionFox is the proven timesheet and project management system for creative professionals. FunctionFox is a collection of interesting, smart, energetic and curious people who love to work together. We work on fantastic software for talented people.